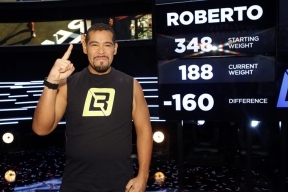 Roberto Hernandez, a 36-year-old physical/health/driver’s education teacher from Burbank, IL was named ‘The Biggest Loser’ at NBC’s exciting live finale Monday night, winning $250,000. He started season 17 at 348 pounds and ended weighing 188, shedding 160 pounds and 45.98 percent of his body weight. Roberto’s twin brother, Luis Hernandez, from Chicago, IL, also a physical/health/driver’s education teacher, took the $100,000 ‘at home’ prize among eliminated contestants. Luis began the show weighing 308, and lost 139 pounds and 45.13 percent of his body weight. He weighed in at finale at 169 pounds. This is the second time in the show’s history that twin brothers became the grand prize and ‘at home’ winners, with twins Bill Germanakos and Jim Germanakos taking home both prizes respectively in season four of the “The Biggest Loser.” The theme for season 17 was “Temptation,” with contestants learning how to deal with all kinds of temptations in the real world, ranging from food to money to electronic devices. Caption 1: The Biggest Loser contestant Roberto Hernandez wins the competition. Caption 2: Twin brothers Roberto Hernandez and Luis Hernandez shed pounds during season 17.